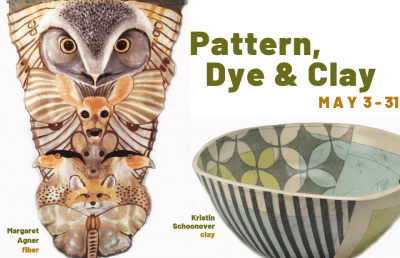 Pots & Prints is a exhibit featuring clay artist Evelyn Ward and printmaker John Furches. Evelyn Ward has been an exhibiting member since 2015. She is from Hurdle Mills, NC. Evelyn creates salt fired functional pottery. Some of the pieces are glazed, some are decorated with colored slips. Salt firing is a process in which salt is added to the kiln at the highest temperature combining with the clay on the surface of the piece and resulting in a distinctive clear mottled glaze. Each piece will be a little different depending on its placement in the kiln. John Furches has been an exhibiting member since 2015 also. His etchings and aqua-tints are produced from hand-drawn zinc plates. He then hand tints some of them with watercolors. His work explores the natural world around us. An avid birdwatcher, John's etchings are snapshots of an intimate view of micro environments we overlook in our busy world today. Pattern Dye & Clay is an exhibit of work by fiber artist Margaret Agner and clay artist Kristin Schoonover. The exhibit will open to the public on Friday, May 3rd from 7:00 till 9:00 pm during the First Friday Gallery Hop. Join us for a celebration and auction of selected works from the art collection of JoAnne Vernon. Donated by her husband, Ken Otterbourg, the sale of the artwork will benefit both Piedmont Craftsmen and Sawtooth School for Visual Art. The celebration and auction will be held at Sawtooth in the Gallery On Saturday, May 18th from 5:00 till 8:00 pm. Reservations are required by May 13th. Price is $50 per person. Use the link below to reserve your space at this special event. Artwork included in the auction by: Jane Goslin Peiser, Mark Ferri, Debra Fritts, Donna Polseno, Beth Tarkington, Michael Sherrill, Billy McClain, Robbie Tillotson, Edward S. Eberle, Nancy Kubale and others. This show will focus on texture an how craft artist employ extreme measures by applying innovative techniques to achieve just the right feel, appearance and consistency to the surface. A variety of artists will be represented as well as media. The show will open during the First Friday Gallery Hop on June 7th. Comfort & Chaos features artwork by wood artist Elia Bizzarri and quilts by Ann Harwell. The exhibit will open during the First Friday Gallery Hop on August 2nd from 7:00 till 9:00 PM. Fire & Earth is an exhibit featuring the artwork of glass artist Warner Whitfield and clay artist Kathy Triplett. the show will open during the First Friday Gallery Hop on October 4th. 41 Deliberate Acts of Random features the amazing random weave baskets of Carla & Greg Filippelli. The show will open during the 1st Friday Gallery Hop on October 4th from 7:00 - 9:00 PM. Earthbound features the artwork of clay artist Marina Bosetti and jewelry artists Una Barrett. The exhibit will open during the 1st Friday Gallery Hop on November 1st from 7:00 - 9:00 PM. Preview Night is a special event for donors, sponsors and Exhibiting Members of Piedmont Craftsmen. Held annually at the Benton Convention Center, Preview Night is the opening for the "Grande Dame of Craft Fairs". Held annually at the Benton Convention Center, the Piedmont Craftsmen's Fair showcases the artwork of one hundred artists from across the United States.